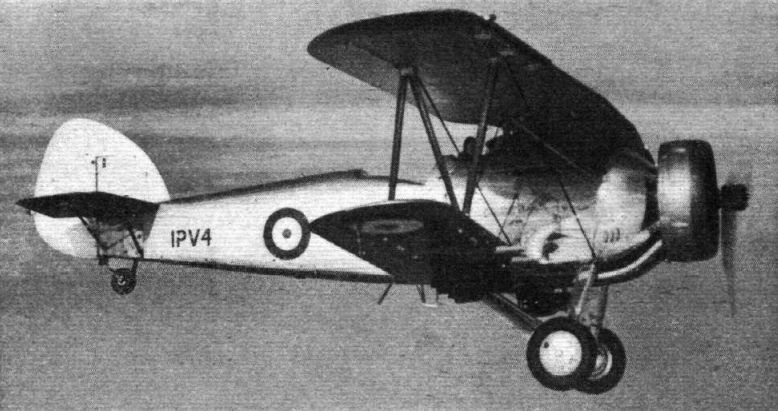 Hawker P.V.4: As the letters indicate, this machine has been designed as a "private venture," that is to say, it was not primarily produced to comply rigidly with any Air Ministry specification, although ДальшеMore>>> it does in fact meet all the requirements of the G.4/31 specification. In addition, however, this particular machine has been designed with specially high load factors, in order to make it strong enough to be used for dive-bombing. It will be obvious that an almost vertical dive from a great height, followed by a flattening out, imposes severe stresses on an aeroplane. These stresses the Hawker P.V.4 has been designed to withstand. In spite of this, the ratio of bare weight to gross weight is remarkably high, the machine carrying 93 per cent, of its own weight as disposable load. The span is 40ft. and the gross weight 6,650 lb. 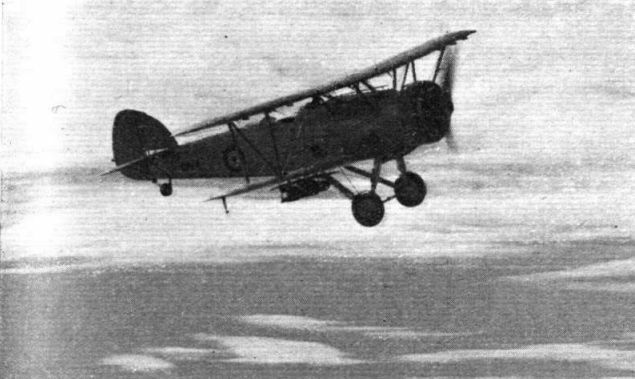 THE last Air Ministry competition for general-purpose machines (specification G.4/31) brought forth from the Hawker works a private venture type designated the P.V.4, but commonly referred to as the Hawker Dive Bomber because its design was planned with special reference to the diving method of bombing attack. This did not entail the sacrifice of performance or load-carrying capabilities, for, with the Bristol Pegasus engine, its speed and climb were outstandingly good and its military load heavy and varied. In appearance and construction the machine resembles a scaled-up Hart, but is modified in detail to cope with the stresses imposed by diving at over 300 m.p.h. with a 1.000 lb. bomb load beneath the wings. Notwithstanding this, however, the structural weight achieved is remarkably low, being only 27 1/2 per cent, of the fully loaded weight. 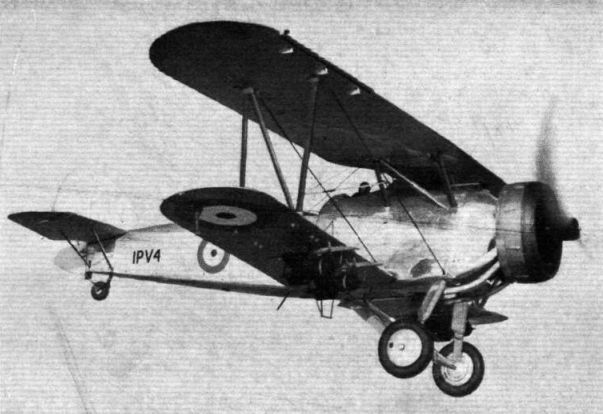 Capable of operating efficiently as a day or night bomber and of fulfilling the exacting requirements from a general-purpose aircraft, the P.V.4 was designed to carry, in addition to the usual fixed equipment, a Vickers gun with 600 rounds of ammunition, a Lewis gun and six 97-round magazines, night-flying gear, a 250 or 1,000 lb. bomb load, four sighter-bombs, a desert emergency load of 140 lb., and W/T and R/T equipment. The P.V.4 was designed in the first instance to take one of the new Bristol Pegasus X moderately supercharged radials rated at 800/840 h.p., although the prototype appeared first with a 690 h.p. Pegasus III. This unit gave a maximum speed of 180 m.p.h. at 5,000ft., and at 15,000ft. the machine would cruise at 152 m.p.h. for 790 miles. The climb to 10,000ft. occupied only 8.2 minutes and 15,000ft. was reached in 14.5 minutes. A service ceiling of 22,000ft. was obtainable. With the fully supercharged Pegasus IV, rated at 640/670 h.p. at 11.500ft., the following results were obtained: Maximum speed, 200 m.p.h. ; cruising speed at 15,000ft., 172 m.p.h. ; range at 15,000ft., 675 miles; climb to 10,000ft. 8.5 minutes; climb to 15,000ft. 12.6 minutes; service ceiling, 25,000ft. 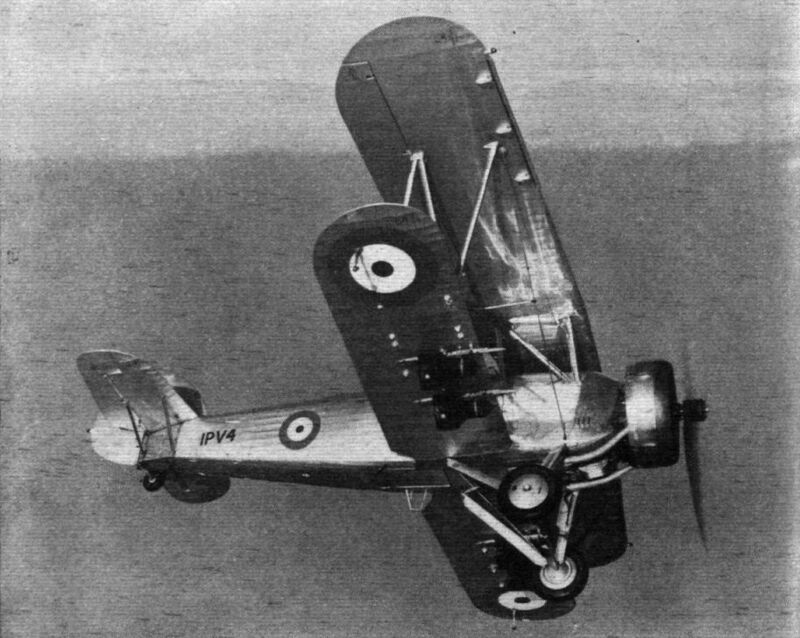 The installation of the Pegasus X brought about still further advances, the maximum speed being no less than 215 m.p.h., which from a large, radial-engined, general-purpose biplane must be considered a brilliant achievement. A standard pattern of Bristol medium-chord ring cowling with nose-type exhaust collector-ring is incorporated, and the airscrew is a two-bladed wooden type. Actually the engine installed for tests in the P.V.4 was the original Pegasus X which performed the type test for its series. In addition to 328 hours bench running, it has done about 100 hours in the air, an engine speed of 3,050 r.p.m. repeatedly being attained during diving tests. The normal r.p.m. are 2,250. In view of the considerably heavier loading, the increased size and heavier construction necessitated by the more arduous duties, the performance figures attained with the P.V.4 compare very favourably with those of the Hart equipped with similar engines. Although the constructional principles employed are similar to these used for the Hart, the overall dimensions of wings, fuselage and tail unit are larger. The main data are as follows: Top span, 40ft. ; bottom span, 32ft. 2in. ; length 29ft. 10in. ; height, 11ft. 10in. ; wing area, 382.5 sq. ft.; wing loading, 17.41b. sq. ft.; undercarriage track, 6ft. 7in. ; gross weight, 6,650 lb. 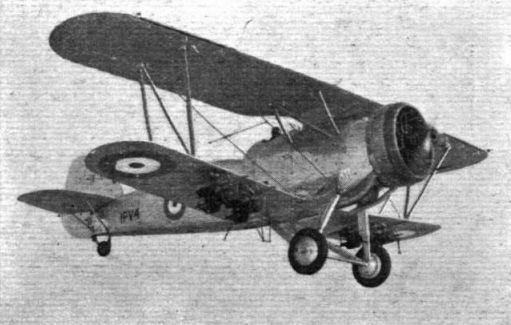 THE HAWKER "P.V.4" DIVE BOMBER fitted with the "Bristol" Pegasus X engine is a general-purpose machine of high performance, designed with particular reference to dive bombing requirements. The Pegasus X is a medium supercharged engine which develops 920 B.H.P. for take-off and 870 B.H.P. at 5,750 feet and maximum R.P.M. The general layout of the Hawker P.V.4 may be gathered from this view. The resemblance to previous Hawker two-seaters is pronounced. 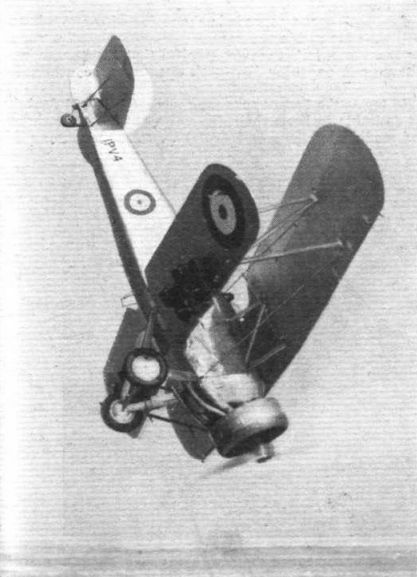 A high-altitude test flight with full military load by Mr. P. W. S. Bulman on the Hawker P.V.4 general-purpose dive bomber biplane. The Hawker P.V.4 biplane (Pegasus X) is a recent type in the design of which dive bombing has been a primary consideration.